Well, there is good news and bad news about our Christmas decorations. The good news is that we truly outdid ourselves this year. First, the cops advised us that it would cause traffic accidents, as they almost wrecked when they drove by. 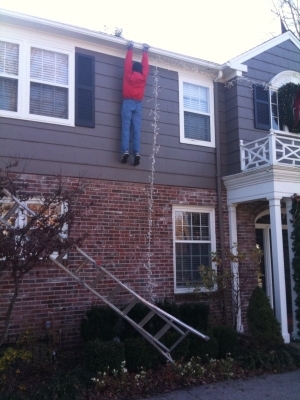 Second, a 55-year-old-lady grabbed the ladder and almost killed herself putting it against our house not realizing it was fake until she climbed to the top. (Needless to say, she was not happy!) She was one of many who attempted to save the poor guy.